The C-Mount 12.5-75mm Varifocal Lens from Computar is designed for use in close-up applications such as factory automation and image processing areas. It captures images in 8.8 x 6.6mm (Ø11mm) format, and it features manual zoom and iris control. The lens is compatible with 2/3" cameras and uses a C-mount for mounting to your camera. 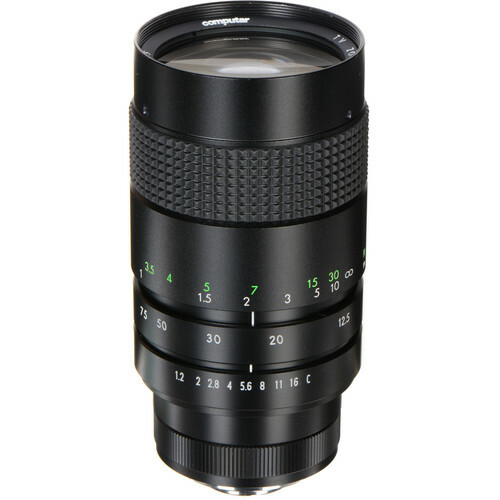 Box Dimensions (LxWxH) 6.7 x 3.9 x 3.7"
C-Mount 12.5-75mm Varifocal Lens is rated 5.0 out of 5 by 3. Rated 5 out of 5 by matty from Excellent Buy This lens was mounted and used to image and record mice in a laboratory setting. Excellent focusing ability, clear image, good range and focal length. Rated 5 out of 5 by Wayne M. from Great Lense This is a great lens. The image quality an clarity and color captured meets my expectations. I found that the advertised data was exactly as listed and plan to buy buy more Computar lenses to add capability to my c-mount cameras ability to capture quality video. It has always been a pleasure buying from B&H. Is there any vignetting with this lens on a Sony Nex 5N? This lens is not recommended for that camera as the lens is made for standard definition cameras and will lead to vignetting of megapixel images. Can this lens be used on the jvc ls300?With a c mount to mft adapter if course. If you have a lens adapter, it can be used. This lens is designed for standard definition cameras, not high definition. While you could use an adapter, you won't get the best picture captured. Will this work on a Sony A77? Not directly as this is a c-mount lens. The Sony A77 has a Sony Alpha/ Minolta lens mount so you would need to convert from the Sony format down to a c-mount which is not very common. No. This lens is intended for 2/3&quot; image sensors (11&times;8.8 mm), meanwhile APS-C cameras like your Nikon D3100 has a sensor size of (23.1&times;15.4 mm) which 3is considerably larger. You will experience severe vignetting even if you applied an appropriate adaptor. I posted a similar question for Computar MLM3X-MP and Tamron M118VP413IR; I have a video camera C mount, 1/1.8 CMOS, 1280 x 1024, USB3 (Ximea MQ013CG-E2); I have to see at a distance of 025 -0.3 m., an area of , more or less, H=10mm., V=8mm.Is good this lens for me? Which is the better choise among the three lenses? Thanks a lot. This lens is absolutely not right for you - the minimal focal distance of this lens is much higher, like a meter or so.Check the NAVITAR lenses by ThorLabs, they will have something for your needs. I purchased this with a metabones adaptor. I had to use the clear zoom on my Sony a3000 one click to remove the vignetting. is this compatible with bmpcc camera or does it need adapter?